Lysosomal Enzyme-Induced Cell Death in MCF7 and Mammary Gland Cells. Breast cancer is a major health problem, being the second deadliest form of cancer in women, behind lung cancer, and it is the leading overall cause of deaths in women between 40 and 55 years of age. Great strides have been made in the diagnosis, research, and treatment of breast cancer. However, breast cancer cells that are resistant to radiation, anti-hormonal therapy, and chemotherapy are also resistant to apoptosis. Given these facts, it is likely that innovative new strategies will be required to treat breast cancer. Lack of such strategies is a major problem, because, until they become available, it is likely that there will be little, if any reduction in the number of new breast cancer cases. The idea of activating lysosomes as a way of treating breast cancer is novel and potentially important. Lysosomal enzymes, which can degrade all biological macromolecules, induce apoptosis in a variety of model systems and in breast tumors in mammary carcinomas in animal models. In this report, we demonstrate that lysosomal enzymes can trigger apoptosis in human breast carcinoma cells as well as in rat mammary gland cells. Apoptosis plays an important role during development, tissue homeostasis, and growth regulation of differentiated tissues, and is recognized as an important target for hormonal, radiation, and chemotherapies. Despite the significant advances in research, diagnosis, and treatment of breast cancer, it remains the second leading cause of cancer death in women. It is estimated that 1 in 8 women in the United States (approximately 12.8 %) will develop breast cancer during their lifetimes. Treatments with antiestrogens are hampered by the development of hormone-refractory disease or hormone resistance . Lysosomal enzymes are implicated in tissue remodeling, which occurs during the physiological involution of the uterus , the prostate gland , and the mammary gland . Lysosomal hydrolases initiate apoptosis in diverse systems. Likewise, increases in the permeability of lysosomal membranes induce cellular changes, leading to apoptosis. Inositol-3-phosphate increases the intracellular concentration of calcium ions and leads to apoptosis in neuronal cells of monkeys through lysosomal enzymes activated by calpain by a leupeptin inhibitable mechanism . Taken together, these studies indicate that the release of lysosomal enzymes into the cytosol activates the apoptotic machinery. Activation of caspases is one of the critical steps leading to apoptosis. Cytosolic leakage of lysosomal enzymes activates a caspase-3-like protease . In addition, cathepsin B possesses a caspase-processising activity and is upregulated during apoptosis in MCF-7 cells . These results suggest that lysosomal enzymes play a role in regulating caspases, proteins that are downstream effectors of apoptosis. Lysosomal enzymes are also implicated in mammary tumor regression. Hormone-sensitive rat mammary tumors respond to ovariectomy with a marked increase in the activity of several acid hydrolases . Cell lysis, occurring during murine mammary tumor regression, results from an autophagic process. The activity of lysosomal enzymes is linked to regression of mammary tumors . Withdrawal of estrogen from MCF-7 xenografts induces breast tumor regression in athymic mice due to impaired cell proliferation and induction of cell death . A causal relationship between lysosomal enzyme upregulation and breast cancer tumor regression, however, has yet to be established. Nevertheless, there is a relationship between activation of the lysosomal compartment and mammary tumor regression following radiation and chemotherapy. Acid phosphatase activity increases in tumor cells of cyclophosphamide-treated mice during the entire period of growth inhibition, but decreases when tumor growth resumed . This suggests that activation of lysosomal enzymes is specific for tumor regression but not proliferation. A close correlation exists between tumor size and lysosomal enzyme activity after irradiation in mouse mammary cancer . Irradiation causes release of hydrolases from lysosomes of mammary tumors. Irradiated tumor cells are localized in primary lysosomes and autophagic vacuoles . The increase in lysosomal enzyme activity seen during tumor regression is responsible for the proteolytic digestion of cytosolic proteins. Spontaneous regression of the Jensen sarcoma and the Flexner-Jobling carcinoma also involve the increased activity of several lysosomal hydrolases [14, 15]. A possible explanation for the cellular lysis of tumors by lysosomal enzymes is that the acid hydrolases are activated by the highly acidic milieu generated by tumor cells undergoing anaerobic metabolism. Decreases in intracellular pH cause apoptosis in human breast cancer cell lines . These data suggest that the deliberate activation of lysosomal enzymes would be an effective alternative to anti-hormone-, radiation-, and chemotherapies utilized against mammary cancer. All of the current treatments for breast cancer kill tumor cells as well as normal, healthy cells. Here, we report that lysosomal enzymes are responsible for degrading MCF7 breast cancer cells that are induced to undergo apoptosis in response to treatment with tumor necrosis factor α (TNF-α). We also demonstrate that lysosomes increased in size and number, and move from basal to apical regions in dying rat mammary gland cells. MCF7 cells were purchased from ATCC (Manassas, VA). The cells were routinely maintained in αMEM (BioWhittaker, Walkersville, MD) supplemented with 10 % fetal bovine serum (Gibco, Grand Island, NY), 2 mM glutamine, penicillin (100 Units/mL), and streptomycin (100 mg/mL) in a humidified chamber at 37°C in 5% CO2/95% O2. Cells were grown in T-25 flasks (Gibco) to yield 5 × 106 cells/mL. Cells were trypsinized, washed with phosphate buffered saline (pH 7.4), resuspended in αMEM, and pooled. To localize lysosomes in MCF7 and rat mammary gland cells, a histochemical acid phosphatase assay (Sigma, St. Louis, MO) was used as previously described . MCF7 cells (5 × 106 cells/mL) were grown on glass cover slides (Fisher Scientific, Pittsburgh, PA), which were submerged in 6-well plates that contained 2 mL/well αMEM. The cells were allowed to attach onto the slides overnight. Apoptosis was induced by treating the cells with TNF-α (1 ng/mL) for 24 h at 37°C. The slides were mounted in CrystalMount (Biomeda Corp., Foster City, CA). The presence of acid phosphatase was indicated by distinct focal precipitates, which were resolved by light microscopy. Nursing Sprague-Dawley female rats were obtained with litters from Taconic (Germantown, NY). The mothers were allowed to nurse their pups for 3 weeks. Hormonal ablation was used to induce apoptosis in the mammary gland. Briefly, the pups were taken from the mothers at day 0 (lactating) and the involuting breast tissue was harvested following weaning. The tissue was fixed overnight in 4 % paraformaldehyde at 4°C, embedded in optimum cutting temperature, frozen in liquid nitrogen, and cut as 5 μm sections onto slides. The slides were examined as described above for the MCF7 cells for the presence of acid phosphatase. Lysosomes contain digestive enzymes capable of degrading all macromolecules: proteins, nucleic acids, lipids, and carbohydrates. To elucidate the role that lysosomal enzymes play during the cell death of MCF7 human breast cancer cells and the mammary gland. An in situ assay was employed to detect AP, a marker enzyme for lysosomes . TNF-α-treated MCF7 cells displayed intense and diffuse positive histochemical staining for AP mostly in the cytoplasm (Fig. 1, lower left and right panels). Positive acid phosphatase staining was also detected in the nuclei of some cells (Fig. 1, lower left and right panels). Lysosomes were larger and more numerous in experimental cells compared to control cells. Cell shrinkage, a characteristic of apoptotic cells, was observed in experimental cells (Fig. 1, lower left and right panels), but was not detected in control cells (Fig. 1, upper left and right panels). These results suggest that there is an increase in lysosomal enzyme activity and staining intensity in MCF7 cells in response to TNF-α. Histochemical Staining for Acid Phosphatase in MCF7 Cells. MCF7 cells were treated in the presence (lower left and right panels) or absence (upper left and right panels) of TNF-α. Control cells exhibit normal morphology for these cells and faint staining for acid phosphatase (AP). Experimental cells, however, display a shrunken cytoplasm and intense AP-positive staining. Magnification: upper left and lower left panels, 40X; upper right and lower right panels, 400X. The histochemical examination of AP in post weaning mammary glands is shown in Fig. 2. The gland was a healthy secretory gland at the onset of weaning, day 0 (Fig. 2, upper right and left panels). Negligible AP staining was detected on day 0. However, four days post weaning (day 4), the mammary gland was highly vacuolated (Fig. 2, lower right and left panels). Day 4 glands displayed marked positive AP staining, which is indicative of the presence of lysosomes, shown as red granules (Fig. 2, lower right and left panels). These results indicate that the gland is histolyzed by lysosomal enzymes. AP Staining of Degenerating Mammary Glands. Day 0 mammary glands (upper left and right panels) and day 4 mammary glands (lower left and right panels) are shown. 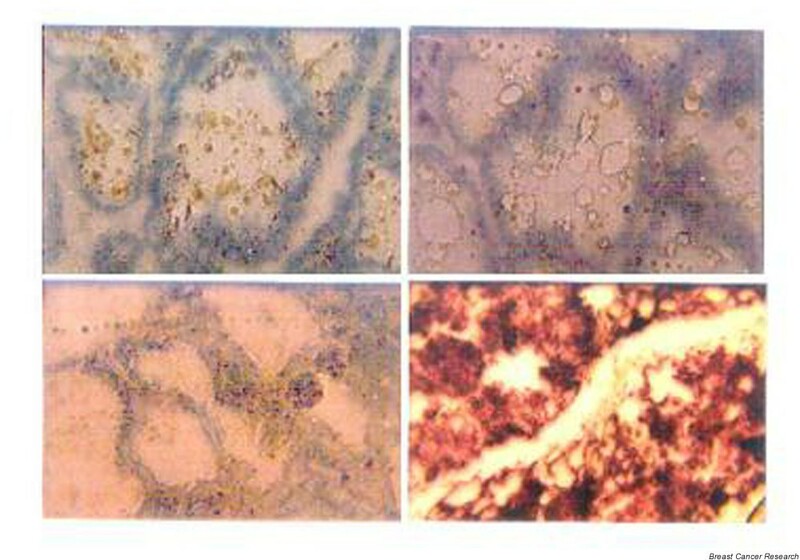 Day 0 control mammary gland cells (substrate for AP was omitted in the reaction; upper left panel) show no positive AP staining, while there is faint AP-positive staining in the day 0 experimental slide (upper right panel). The day 4 experimental mammary gland shows marked staining for AP and altered cytoplasmic morphology (lower right panel) relative to the control slide (lower left panel). The magnification for all of the panels was 400X. Consequently lysosomal enzyme degradation, when triggered by an appropriate signal, such as 20-hydroxyecdysone in apoptosis of insect tissues or by hormone ablation in apoptosis of the rat mammary gland, results in the demise of the aforementioned tissues. Indeed, this organelle can be experimentally manipulated to release its hydrolases when apoptosis is desired. For instance, to induce tumor regression in breast cancer or other types of cancers. This would also lead to cell killing that is directed more specifically against cancer cells, while sparing healthy cells.